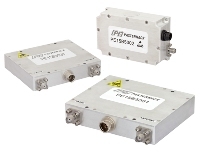 The new bi-directional RF amplifiers from Pasternack consist of 2 narrow band models that operate in L-Band (1.35 to 1.39 GHz) and S-Band (2.4 to 2.5 GHz). These designs utilize highly linear Class AB LDMOS semiconductor technology. A general purpose broadband model is also featured which covers 30 MHz to 3 GHz and uses Class A GaAs semiconductors. Typical gain levels for these amplifiers range from 20 to 23 dB with ±0.5 dB gain flatness. The key advantage of these designs is fast switching capability (1 microsecond typical) between Transmit (Tx) and Receive (Rx) states where high output power is generated, while at the same time, the sensitive receiver section has a 2.5 dB noise figure and sufficient RF gain levels to maintain a high data rate link. These models are designed for use in both military and commercial applications and are capable of supporting any signal type and modulation format, including but not limited to 3-4G telecom, WLAN, OFDM, DVB and CW/AM/FM. The company’s bi-directional amplifiers utilize the latest technologies and design methods that offer high power density, efficiency and linearity in small lightweight environmentally sealed packages with SMA connectors. These modules also feature a quick-connect circular locking connector for DC and control functions. All designs use a single voltage supply with voltage regulation. “Pasternack’s selection of in-stock bi-directional amplifiers exhibit fast transmit and receive switching capabilities, long transmission range and highly efficient operation which are critical for use in applications such as unmanned aerial vehicles and cellular networks,” explains Tim Galla, Active RF Components Product Manager at Pasternack. Pasternack’s broadband bi-directional amplifiersare in-stock and ready to ship. You can view these components by visiting http://www.pasternack.com/pages/Featured_Products/coaxial-packaged-bi-directional-amplifiers.htm.